A Kumar, V Sharma. Antibacterial activity of allicin from Allium sativum against antibiotic resistant uropathogens. The Internet Journal of Infectious Diseases. 2009 Volume 8 Number 1. Antibacterial activity of A. sativum was tested against gram-positive and gram-negative bacterial isolates from Urinary Tract of Indian patients, which were confirmed for resistant against commonly used antibiotics for urinary tract infections. In present study, only five quantities (10, 20, 30, 40 and 50µg) of aqueous allicin from A. sativum cloves and leaves were used, which has antibacterial activity against test isolates by disc diffusion method. The maximum inhibitory activity of allicin against all test isolates was observed at 40µg and the quantity was found statistically significant (P< 0.01) for antibacterial activity of allicin extracted from A. sativum cloves and leaves against UT bacterial isolates. Allium sativum belongs to the family Liliaceae, commonly known as garlic. Garlic is a well-known indigenous herbal medicine since ancient times and held a place of honor in Indian traditional ayurvedic medicine. Most of therapeutic effects are ascribed to specific oil and water-soluble organosulphur compounds, which are responsible for the typical odor and flavor of garlic (1). Fractionation and analysis of aqueous garlic extract have shown that the active ingredient is allicin, a low-molecular-weight compound whose biological activity is rapidly abolished by exposure to thiols (such as L-cysteine), heat, or alkali (2). Reuter et al. (1996) and Harris et al. (2001) reviewed the therapeutic effects of Garlic on the cardiovascular system, antibacterial, antiviral, antifungal, antiprotozoal, anticancer, antioxidant, immuno-modulatory, anti-inflammatory hypoglycemic and hormone like effects (3, 4). This study will focus only on antibacterial activity of A. sativum cloves and leaves. 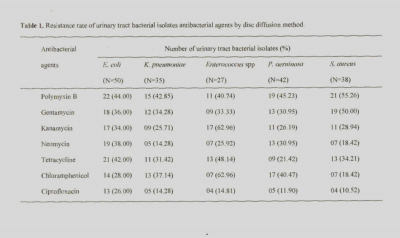 E. coli and S. aureus are the most prevalent urinary tract pathogens capable to causing urinary tract infections (UTIs). There are several reports on the phenomenon of development of antibiotic resistance in human urinary tract (UT) pathogens i.e. E. coli, S. aureus, K. pneumoniae, P. aeruinosa, Enterococcus spp. (5, 6, 7). Among many therapeutic applications of garlic, there are few reports published on its use as a natural herbal antibiotic (8, 9, 10). In present study we have tested specifically the antibacterial activity of aqueous allicin from cloves and leaves of A. sativum against antibiotic resistant gram-negative and gram-positive UT bacteria. Fresh cloves and leaves of A. sativum were collected from agricultural land, of Haridwar, Uttarakhand (U.K.) and Bulandshahr, Uttar Pradesh (U.P. ), India for present study. Adequate quantity (100gm) of samples was kept in fresh polythene bags individually and was taken into laboratory to process on the same day at room temperature. The aqueous extract of samples were aseptically prepared with 100ml sterile distilled water as solvent using mixer grinder and collected in sterile vial after filtration first through fine mesh cloth and sterilized using a membrane filter (0.2µm pore size). The crude extracts of A. sativum cloves and leaves were used to purify and identify the allicin according to described method of Lawson et al. (1991) (11). A 1mg/ml stock solution for A. sativum cloves and leaves were adjusted in sterile distilled water and used for further study. Assay discs were prepared from Whatman paper (Whatman Limited, England) and discs were cut 5mm in diameter with the help of punching machine (12). The discs were prepared for each concentration of A. sativum cloves and leaves by micropipette. Disc contained different quantity (10, 20, 30, 40 & 50 µg/disc) of allicin of A. sativum and was dried for 30 minutes at room temperature. Soaked discs were aseptically transferred on the medium surface to determine the antibacterial activity of all concentrations of A. sativum cloves and leaves against test bacterial isolates. Pure isolates of E. coli, S. aureus, K. pneumoniae, P. aeruinosa, Enterococcus spp. were used to test antibacterial activity of A. sativum. Bacteria were isolated from Indian patients, suffering with urinary tract infection and were confirmed for antibiotic resistant i.e. Polymyxin B, Gentamycin, Kanamycin, Neomycin, Tetracycline, Chloramphenicol and Ciprofloxacin in our laboratory by disc diffusion method. Bacterial isolates were maintained on nutrient agar slants, routinely. Bacterial isolates were grown on nutrient broth at 37±10 C for 24 hours and viable cell count was determined by plate count method. (13). The viable bacterial cells were adjusted at 1.2X106cells/ml and this concentration was used to determine the antibacterial activity of samples. Disc diffusion method was performed according to Bauer et al. (1996) (14) with slight modifications. Autoclaved Muller-Hinton agar medium (20ml/Petri plate) and bacterial isolates (1.2X106cells/ml) were mixed gently and poured into plates. After solidifying the medium at room temperature, discs containing different quantity of samples were placed on the surface of medium plate. The plates were left at room temperature prior to incubation at 37±10 C for 24 hours to allow diffusion of sample into the medium. The zone of inhibition was measured in millimeter (mm) and inhibition zones with diameter less than 7mm were considered as having no antibacterial activity. Finally the results were recorded after subtraction of 7mm diameter of inhibition zone. Control discs containing sterile distilled water were performed simultaneously with all experiments to check the activity of sample solvent. All quantity of A. sativum cloves and leaves were tested in triplicate and mean was calculated accordingly. Student-t-test was applied to determine statistical difference in antibacterial activity of A. sativum for cloves and leaves against test organisms (Mahajan 1984) (15). Disc diffusion method was applied to confirm the resistance status of urinary tract pathogens against many antibiotics such as Polymyxin B, gentamycin, kanamycin, neomycin, tetracycline, chloramphenicol and ciprofloxacin. Resistance rate was determined as given in table 1. In the study, most resistance bacterial isolates of E. coli, S. aureus, K. pneumoniae, P. aeruinosa, Enterococcus spp were used to check the antibacterial activity of A. sativum cloves and leaves samples, were collected from U.K. and U.P. Crude extracts of A. sativum cloves and leaves from U.K. and U.P. were tested for antibacterial activity against gram positive and negative UT bacteria and the extracts showed antibacterial activity higher in U.K. samples as compare to U.P. (data not shown). The further study was focused on U. K. samples. On the basis of several past reports, A. sativum was used as a traditional medicine and has exhibited wide range of biological activity (1, 3, 4) and antimicrobial activity of A. sativum is well recognized in relation to those organisms that were antibiotics resistant. In India, Sharma et al. (1977) conducted study, which reveals that crude garlic extracts exhibits greater antibiotic action against Bacillus anthracis (anthrax) than tetracycline, penicillin, streptomycin, erythromycin and other antibiotics (16). The increasing resistance rate against many antibiotics in community has led to a demand for new herbal agent that may be used to decrease the spread of these bacteria. There are huge literatures on the antibacterial effects of fresh garlic juice, aqueous and alcoholic extracts, lyophilized powder, steam distilled oil and other commercial preparations of garlic. Garlic is active even against organisms that have become resistant to antibiotics (17). In 2006, Adeniyi et al. have reported increasing multidrug resistance uropathogenic bacteria by plasmid profile (18). Allicin of garlic is well documented as an active ingredient in herbal medicine and has already been proved to have antimicobial efficacy against those microbes, which are already resistance against many antibiotics (19). Therefore, the present study was performed to purify and identify the allicin from cloves and leaves of A. sativum as natural source. Further it has already been established that natural drugs have few side effects as compare to allopathic drugs. Antibacterial activity of aqueous allicin was checked against antibiotic resistant gram-negative and gram-positive UT bacteria by disc diffusion method and results were summarized in table 2). All test isolates were found sensitive with aqueous allicin that was extracted from A. sativum leaves and cloves. A total five quantities i.e. 10, 20, 30, 40 and 50 µg/disc of allicin from both parts of A. sativum were used to determine maximum inhibitory quantity against antibiotics resistance urinary tract bacteria. Out of five quantities of allicin only 40µg/disc showed highest inhibition zone in case of A. sativum cloves i.e. 22.50 mm for E. coli, 18.50 mm for K. pneumoniae, 17.00 mm for Enterococcus spp., 19.50 mm for P. aeruginosa & 23.50 mm for S. aureus and in case of A. sativum leaves 16.00 mm for E. coli, 15.50 mm for K. pneumoniae, 11.50 mm for Enterococcus spp., 11.00 mm for P. aerguinosa & 16.50 mm for S. aureus. Gram-positive bacteria showed significant higher sensitivity than gram-negative bacteria at the maximum inhibitory concentration of allicin. In 2006, Indu et al. previously have also reported that garlic extract possessed low level of antibacterial activity against gram negative bacteria due to major plant pathogens are gram negative having an effective permeability barrier such as outer membrane, MDR pumps etc (20). Among all gram-negative bacteria E. coli showed maximum zone of inhibition (22.50mm). This finding indicates the maximum inhibitory action of allicine was on E. coli and S. aureus. Results of quantitative efficacy were found similar as previously reported (21). Allicin from A. sativum cloves against test bacteria have higher activity (Statistically P<0.01) than A. sativum leaves in the study. Results demonstrate that A. sativum remarkably sensitive agent against antibiotics resistant gram- negative and gram-positive UT bacteria. The results are in close agreement with observation of previous researchers (8, 9, 22, 23). A growing body of scientific evidence confirms that natural herbs and spices exhibit antibiotic properties that are equivalent (24) and may be superior to drugs (8, 19, 25). Many investigations suggested that the herbal antibiotics might be used to treat the urinary tract infections. But the present study indicates the use of herbal antibiotics in the treatment of urinary tract infections that did not treat by antibiotics. Therefore A. sativum has considerable sensitivity against antibiotics resistant UT bacteria and may be used a substitute of antibiotics in near future. 1. Block, E, 1985. The chemistry of garlic and aims. Sci. Am. 252: 114-119. 2. Bareme, F. E. and M. R. Tomaey, 1977. Isolation, purification, identification, synthesis and kinetics of activity of the anticandidal component of Allium sativum and a hypothesis for its mode of action. Mycologia. 69: 793-825. 3. Reuter, H. D., H. P. Koch and Lawson D. L. 1996. Therapeutic effects and application of garlic and its preparations. The garlic: the Science and therapeutic application of Allium sativum L. and related species 2nd ed. (Koch, H.P. and Lawson, DL edi. ): 135-212, William Wilkine, Baltimore, MD. 4. Harris, J. C., S. Cottrell, S. Plummer and D. Lloyd, 2001. Antimicrobial properties of Allium sativum (garlic). Applied Microbiology and Biotechnology. 57(3): 282-286. 5. Bergeron, M. G. and M. Oullelte, 1998. Preventing antibiotics resistant through rapid genotypic identification of bacteria and their antibiotic resistance genus in the clinical microbiology laboratory. Journal of Clinical Microbiology. 36: 2169-2172. 6. Witte, W. 1999. Antibiotic resistant in gram-positive bacteria: epidemiological aspects. J. Antimicrobial. Chemo. 44: 1-9. 7. Scheckenberger, P. C., E. Ilendo and K. L. Ristow, 2004. Incidence of constitutive and inducible clindamycin resistant in S. aureus & coagulase-negative Staphylococci in a community and a tertiary care hospital. Journal of Clinical Microbiology. 42: 2777-2779. 8. Sasaki, J., T. Kita, K. Ishita, K. Uchisawati and H. Matsue, 1999. Antibacterial activity of garlic powder against Escherichia coli 0-157. J. Nutr Sci Vitaminol (Tokyo). 45: 785-791. 9. Ankri, S. and D. Mirelman, 1999. Antimicrobial properties of allicin from garlic. Microbes Infection. 1: 125-129. 10. Elizabeth, K. M. 2001. Antibacterial activity of Allium sativum on some pathogenic bacteria. Indian Journal Microbiology. 41: 321-323. 11. Lawson, L.D., Z.J. Wang, B.G. Hughes 1991. Identification and HPLC of the sulphides and Dialk(en)yl thiosulphinates in commercial garlic products. Planta. Med., 57: 363-370. 12. Kumar, A. and M. Kashyap, 2003. Penicillium sp. ; Production and antibacterial activity of an unusual secondary metabolite of Indian soil isolate, in vitro. Eco. Res. J. Bioscience. 2: 54-60. 13. Kumar, A., R. Kaushik, E. Varshney, A. Kashyap and M. K. Kashyap, 2005. Prevalence of Penicillium chrysogenum, its qualitative, quantitative determination and antibacterial activity in Indian soil. Asian J. Plant Sci. 4(4): 429-434. 14. Bauer, W., W. M. M. Kirby, J. C. Sherries and M. Turck, 1996. Antibiotic sensitivity testing by standardized disc method. Am. J. Clin. Pathol. 45: 493-496. 15. Mahajan, B. K. 1984. In methods in Biostatics (revised enlarged IV edition) Smt Indu Mahajan W.E.A., New Delhi: 1-304. 16. Sharma, V. D., M. S. Sethi, A. Kumar and J. R. Rarotra, 1977. Antibacterial property of Allium sativum: in vivo & in vitro studies. Indian Journal Experimental Biology. 15: 466-468. 17. Jezowa, L., T. Rafinski and T. Wrocinski, 1996. Investigations on the antibiotic activity of Allium sativum L. Herba Pot. 12: 3-13. 18. Adeniyi, B. A., Amajoyi, C. C. and Smith, S. I., 2006. Plasmid profile of multidrug resistant local uropathogenic E. Coli, Klebsiella spp., Proteous spp., Pseudomonas spp. Isolates. J. Biol. Sci. 6 (3): 527-531. 19. Cutlew, R. R. and P. Wilson, 2004. Antibacterial activity of a new, stable, aqueous extract of allikin against methicillin-resistant Staphylococcus aureus. British J. Biomed. Sci. 61 (2): 71-74. 20. Indu, M. N., A. A. M. Hatha, C. Abirosh, U. Harsha and G. Vivekanandan, 2006. Antimicrobial activity of some of the South-Indian species against serotypes of Escherichia coli, Salmonella, Listeria monocytogenes and Aeromonas hydrophila. Brazilian Journal of Microbiology. 37:153-158. 21. Rees, L. P., S. F. Minney, N. T. Plummer, J. H. Slater and D. A. Skyrme, 1993. A quantitative assessment of the antimicrobial activity of garlic (Allium sativum). World Journal of Microbiology and Biotechnology. 9: 303-307. 22. Jonkers, D., J. Sluimer and E. Stobberngh, 1999. Antibacterial effect of garlic and omeprazole on Helicobacter pylori. Antimicrobial Agent and Chemotherapy. 43 : 3045-3054. 23. Prews, H. G. 2001. Organooil may protect against drug resistant bacteria, Georgetoun Researcher Finds, Science Daily. 24. Lai, P. K. and J. Roy, 2004. Antimicrobial and chemopreventive properties of herbs and spices. Curr. Med. Chem. 11: 1451-1460. 25. Gul, N., T. Y. Mujahid, N. Jehan and S. Ahmad, 2004. Studies on the antibacterial effect of divalent fraction of Curcuma longa against urinary tract infection isolates. Pakistan J. Biological Sci. 7(12): 2055-2060.